Welcome! I am Jason M. Rodgers, sole proprietor and craftsman of Jayemar Guitars (say my initials, J.M.R., like "jay-em-ar"). Each guitar is built in my small home shop in Lake Oswego, Oregon, USA. It is my mission to create consistently excellent instruments using only local and domestic US woods. 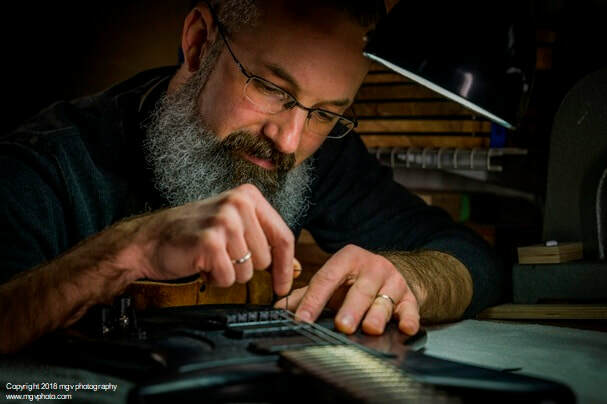 I specialize in multi-scale, extended-range guitars and basses, and a variety of pickups wound in-house come standard on every instrument. You're going to want to check these out! Why choose a Jayemar guitar? Because you're searching for the right guitar. Do you feel like there's a certain "something" that's missing from the big-name guitars you've been playing? Are six strings not enough? Curious about this thing called "multi-scale"? Take a look at the options available in a Jayemar guitar. Whether it's simple and stripped down, or blinged-out and sprouting switches; whether its built for wailing the blues, or skull-crushing metal, I think you'll find a combination of options that says you. Because you care about the responsible use of natural resources. Not only are you looking for a fine, hand-crafted musical instrument, you are also making a choice about materials and design. It is my commitment to only build guitars using locally and domestically sourced woods. Across the Pacific Northwest - within the state of Oregon alone - a wide variety of beautiful, tonally sound, and sustainably harvested woods can be found, and suitable substitutes for exotic hardwoods are available within the continental US. As a craftsman and consumer of natural resources, I feel that I have a responsibility to maintain a mindful and efficient use of these materials. I am especially fond of recycled, reclaimed, salvaged, and “up-cycled” woods. I would love to build a guitar for you using wood holding special significance, such as: wood from a family property tree, a piece of house or barn, or that old slab of wood dad tucked away with unrealized grand plans. From the bold modern design, to the beautiful local hardwoods, from the multi-scale fretboard, to the hand-wound pickups, Jayemar Guitars are built to be musical tools to help you reach your expressive and technical potential.​ I look forward to building your next guitar!